Cottage garden November calendar. Thing’s to do in the cottage garden this month. November marks the coming of the cold weather it can be damp and frosty and the cottage garden requires a little help this month. You may not have many flowers but your garden can be full of autumn colour with golden foliage and red berries. The sunshine may be strong in the day but at night it can get wintry so if you do have any tender plants start to think about putting them in the greenhouse. 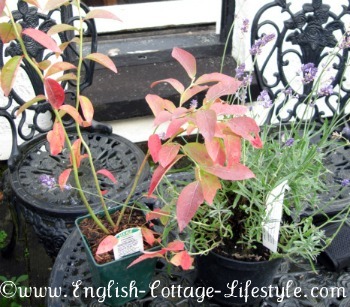 Most traditional cottage plants are hardy so this may not be a concern but if in doubt, protect your plants. Plan in your November calendar to start thinking about wildlife. If you want to attract birds into your garden leave out bird food and water, make sure there is a constant supply as the birds will return expecting food. Keep an eye out for wildlife in your bonfire heap, hedgehogs like to nest, so check your heap before lighting a fire. To help other wildlife that can be useful for the cottage garden create a small shelter of logs, leaves and old plant pots turned upside down to provide a small cosy shelter. Remember to clean thoroughly any nesting boxes for birds as dirty nesting boxes can spread disease. November also brings in unwanted wildlife. If you are saving any berries for your cottage Christmas garlands, sprigs of holly for example, put netting over the berries to stop the birds from eating your best décor. Squirrels and birds will be after bulbs so cover them with chicken wire. If you have a soft spot for wildlife and want to help but not have all your plants and berries eaten leave a few plants or bushes for them and cover the ones you want to keep. For me part of the joy of having a garden is the wildlife that it brings and I always plant a few things just for the birds and other creatures. Temperatures vary all over the country and your garden will have it’s own micro climate so take that into consideration. You may need to adjust this November calendar a little for your own cottage garden but it’s a good place to start. Make a note of these tasks in your November calendar. November Calendar: Flowering Cottage Plants. This month you need to protect plants from frost. A layer of dry leafmould, straw or bark chippings placed over the soil will help. Bulbs can be protected with a thick layer of mulch or compost. Clear away any old summer bedding. Now is the time to dig up any shrubs that you don’t like or move them to a better spot ready for spring. Plant any spring flowers that you want such as pansies, wallflowers and forget-me-nots. Plant lily of the valley. Take root cuttings of perennials. If you are concerned about a plant over winter take cuttings now and preserve them in the greenhouse that way if the plant dies outside you have another plant to replace it. The end of autumn is the time to start thinking about planting trees, roses and shrubs. Chrysanthemums can be bought or planted into containers to add a little colour to your cottage garden. Clean old leaves from roses and the ground especially if they have disease. Throw away the diseased ones and make leaf mould with the old ones. Plant tulips before the end of the month if possible. Keep an eye on any bulbs either forced (especially if covered in straw or mulch) or in storage for damage. Herbs, Vegetables, Soft Fruit and Fruit Trees. Harvest time: Brussels sprouts (stake any tall ones left), carrots, cauliflower, cabbage, leeks, kale kohlrabi, parsnips, peas, spinach, swede, swiss chard, turnips, and winter salad leaves. Squashes, pumpkins and marrows once harvested need to be stored under cover. 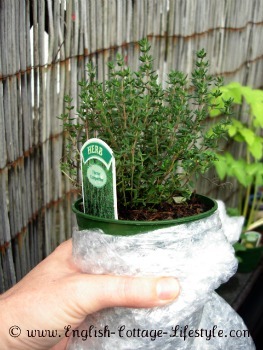 Herbs in containers can be bought into the green house for protection or wrap the container with bubble polythene, horticultural fleece etc to keep the soil warm. Move them against the wall if outside to shelter them. Protect cauliflower heads from frost by covering the head with the leaves; tie with a natural elastic band stockings also can be used. Plant fruit trees and bushes. Plant blackcurrant bushes. You still have time to order them and plant in winter. Start pruning pear and apple trees then add mulch. Harvest and store apples and pears this month. Read ECL e-zine issue #006 for more about storing and preserving fruit. Onions and garlic that has been drying can be cleaned and stored now. November Calendar: General Cottage Gardening Jobs. Prepare soil if you want to plant new hedges. Remember to prepare the soil before planting any trees dig and add manure or compost. 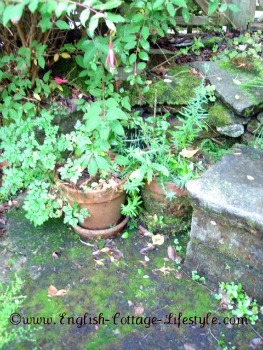 Clean cottage garden pathways to make sure that algae does not make it slippery to walk on. Clean any ponds remove leaves etc. If they are not natural ponds remove any pumps or lights.